This article was published by ComputorEdge , issue #2848, 2010-11-26 , as the cover article, in both their PDF edition (on pages 6-14) and their website. There are innumerable types of tasks and projects for which you might want to track your time expended, just as there are innumerable reasons for doing so. For instance, you might decide to participate in National Novel Writing Month or Script Frenzy, and in addition to the one-month calendar limitation, you want to find out how much clock time was required to crank out your first novel or screenplay. Yet the people most commonly in need of time tracking are the freelancers, attorneys, and other office professionals who invoice their clients by the amount of time spent on each task (aside from any materials costs). 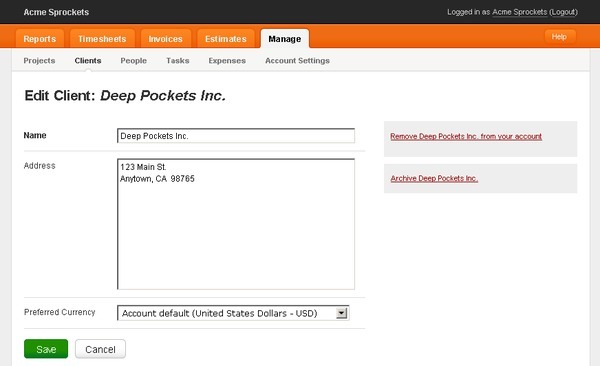 In light of the ongoing transition of desktop computer applications to the Web, it should come as no surprise that various software developers and vendors have created online time-tracking and invoicing tools, to replace the venerable desktop equivalents that have served their users for so long. One such Web-based tool is Harvest, which is a product from the software company Iridesco. 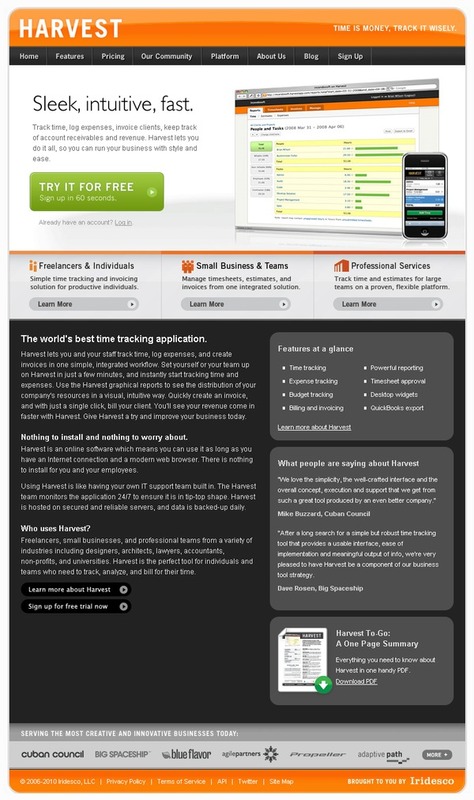 Harvest is billed as "The world's best time tracking application." To find out if that claim is true, or, more relevantly, to find out if Harvest might be the ideal tool for your own time-tracking and invoicing needs, you can take it for a test spin, at no financial cost, using their 30-day trial offer. 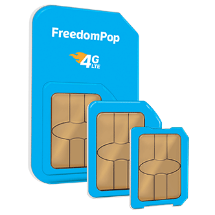 Start by visiting their website, and click on the green button to try it for free. This takes you to a straightforward sign-up page, where at a minimum you must provide a company name, a personal name, your email address, a password, your type of business (freelancer, or a business with fewer than 10 employees, or one with 10 or more employees), and what they call a "private website address", which is simply a subdomain name (more on that in a moment). You optionally can specify your time zone and preferred currency. Oddly, the default time zone is that of Hawaii, even though my IP address is (unfortunately) not located in the beautiful islands of Hawaii, and the offices of Iridesco are located in the concrete jungle of New York City. If and when you provide all of the required information, and you are able to choose a subdomain that has not already been taken, then you will be shown a welcome page, which informs you that a confirmation message has been sent to the email account that you had listed earlier. Unlike just about every other online service that requires registration with a valid email address, Harvest does not verify that you have access to the address provided. The message will reiterate your business's unique URL for logging into the system. Harvest tries to set a subdomain name based upon your business name. For instance, if you do business by the name Acme Sprockets, then you will log into your Harvest account at the address http://acmesprockets.harvestapp.com/, assuming no one else has taken that address yet. When you login to your account, the default page is the Overview subsection within the Reports section. You can close and later reopen the page tip (the section with the gray background, which contains help information) for this and all subsequent pages. Confusingly, even though you have not created any projects, worked on any tasks, or logged any time, the Time Summary already reports half an hour, and the Recently Active Projects section shows a project named "Internal", with 0.50 hours. Perhaps the Iridesco developers decided that it would be helpful to start off with a dummy project with some time already included, just so newcomers could see at least some entries displayed in the user interface. This is arguably more condescending than useful for such a simple application as this one, and runs the risk of confusing someone who is not sure whether the "Internal" project can be safely discarded or whether doing so could damage their account — similar to the system tables that exist in many newly-created databases. Let's start with a clean slate. Go to the Timesheet section, which by default displays the Time subsection. Delete the "Admin" entry by hovering on its row and clicking the "X" button that appears to the right of the Edit button. Then go to Manage > Project, and delete the dummy "Internal" project. Although the page tip for the Overview page recommends some initial steps for getting started — such as creating your projects — it fails to mention a critical one that you should do immediately: Define your clients, which need to exist in the system before you start assigning them to projects. Go to Manage > Clients, where initially only your own company is listed as a client. Some people new to business may be confused by this, but it's a useful technique to be able to account for internal work by designating your own company as the client. Create a new client for billable work. Now you can create a new project and associate it with your new client. Go to Manage > Project, and create a new project, with a client, name, project code, and some project notes. 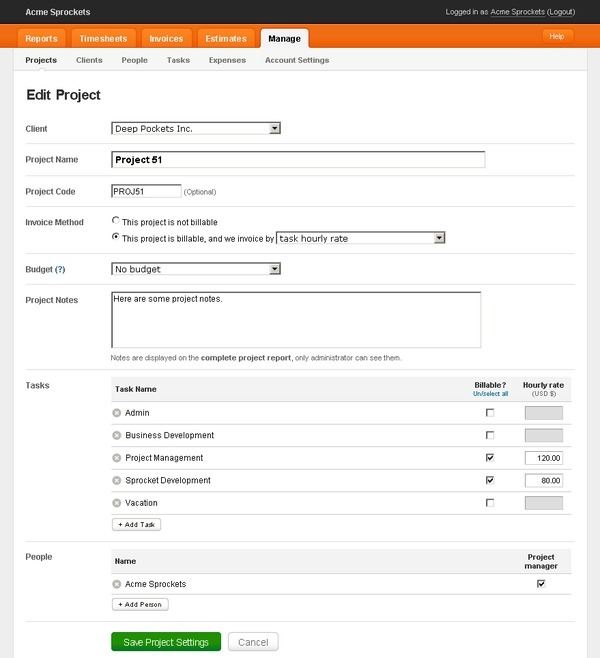 In addition, you can make the project billable, set an hourly rate for the "Project Management" task if desired, and add new tasks and rates for non-project management work. When you save your changes to this particular project, you are returned to the Manage Projects page. Within this Manage section, you can add people (manually or by importing the data from an Excel spreadsheet) and manage existing ones. You can optionally include coworkers and other collaborators by giving them the login information, so they can access the account as well. You can add new tasks (Manage > Tasks), of four different types: common tasks (automatically added to new projects) versus others, and within these two categories, tasks billable by default or otherwise. Expense categories can be created if the existing six ones are not adequate. 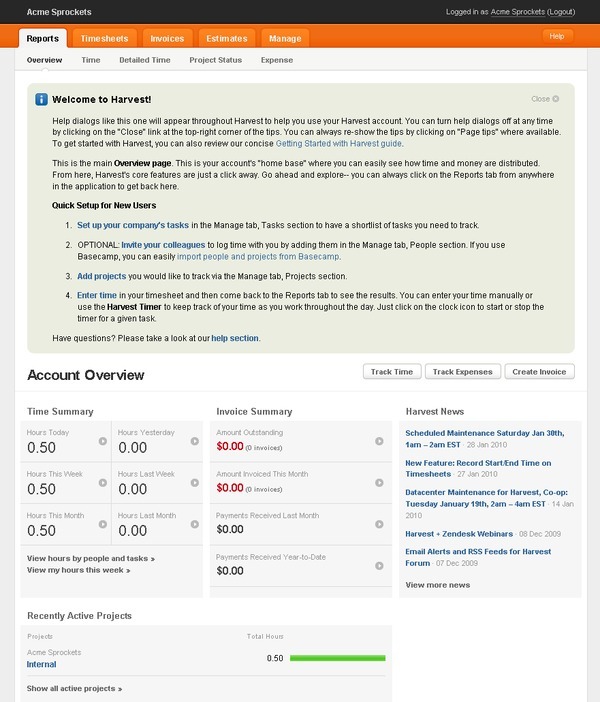 Lastly, you can change your Harvest account settings, including a default hourly rate (handy for freelancers); you can disable the expense tracking, invoices, and estimates modules; you can integrate your Harvest account with Basecamp (an online project management tool), Highrise (an online CRM tool), and QuickBooks. In the Timesheet section, you can add expenses using the categories mentioned earlier, and assign them to different projects. But the subsection that you would probably use more than the other, is Time, where you can manually assign hours and notes to the tasks of any project. You can also select a project/task combination, and then click the "Start Timer" button, go off and (supposedly) work on that particular task. When you return to the page, you would click the "Stop" button, and the correct time would automatically be added to that task. Any such timed tasks can always be modified (i.e., fudged) later. Now that you have done all that work for your client, and diligently kept track of your time on task, you should reap the rewards, by putting together an accurate invoice to send to the client. 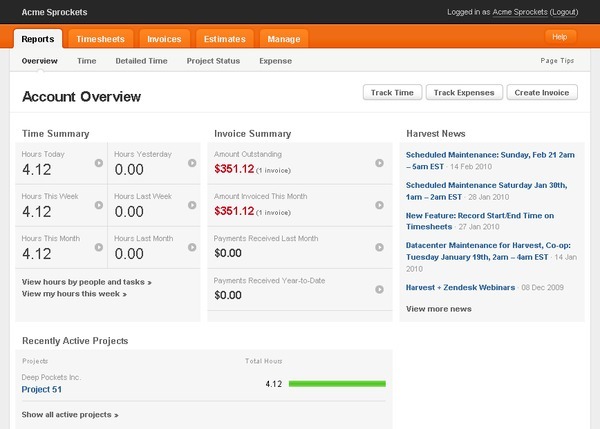 In the Invoices section, the Dashboards subsection has a button for creating a new invoice. 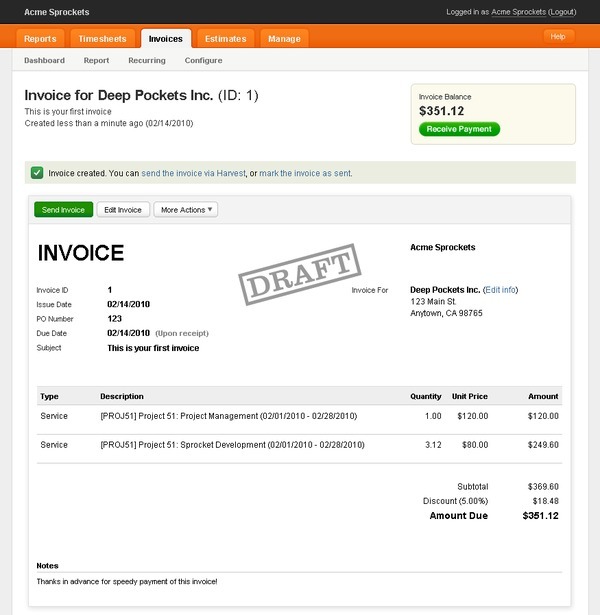 Within the invoice detail page, you can specify the projects to invoice for (in case you are working on multiple projects for this client), specify the hours and invoice type, and include any expenses. On the subsequent page, you can optionally enter a purchase order number, change settings such as due date, enter a subject line, and optionally add a tax, a discount, and some notes. If no hours appear on the invoice, then probably what happened is, on the previous screen, you left the "Billable hours" option at the default, which is to include uninvoiced billable hours from the previous month. Change this to either the current month, or click the radio button for "All uninvoiced billable hours." That default seems to be a poor choice by Iridesco. When you are satisfied that everything is set correctly, save the invoice. When you return to the Overview page, you should see that the time entered earlier, as well as the new unpaid invoice, are included in the summary. This is just a brief introduction, but should give you a good idea as to the capabilities available. Harvest appears to have all of the major features required for time tracking. No doubt the programmers at Iridesco have had ample time to iron out the bugs, given that the application was launched in March of 2006. If you want to bring together all of your project tasks, and organize your invoicing in a central location, then consider hooking up with Harvest, and then go forth to cultivate paying clients! Copyright © 2010 Michael J. Ross. All rights reserved. That all [website enhancement] sounds great. You surely are a wizard!